This collection discusses how official legal systems do and should respond to the reality of a plurality of family types and origins within their jurisdictions. It further examines the challenges that arise for practitioners, including lawyers and judges, when faced with such plurality. Focussing on empirical research, the volume presents legal and sociological data of unprecedented comparative depth. It also includes a discussion of how members of minority families respond to the need to organise their legal relationships, and to resolve their disputes in the shadow of official legal systems which differ from those of their familial and communal traditions. 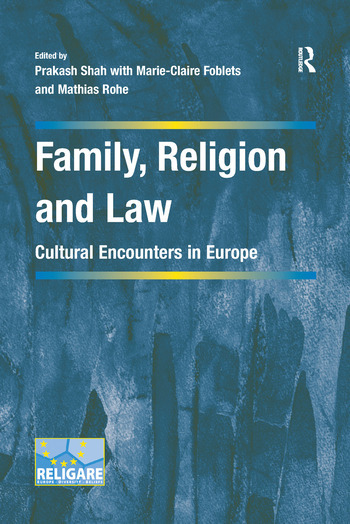 The work invites reflection, and demonstrates the urgency and complexity of the questions regarding the search for justice in the field of family life in Europe today. Dr Prakash Shah is Reader in Culture and Law, and Director of GLOCUL: The Centre for Culture and Law at Queen Mary University of London. He specializes in legal pluralism, religion and law, ethnic minorities and diasporas in law, immigration, refugee and nationality law, and comparative law with special reference to South Asia. He has published widely and lectured internationally in these fields. Professor Marie-Claire Foblets is Director of the Department of Law & Anthropology at the Max Planck Institute for Social Anthropology, Germany. For many years she headed the Institute for Migration Law and Legal Anthropology at the Law Faculty at the Catholic University of Leuven, Belgium. She currently leads the RELIGARE research project financed by the European Commission under its 7th Framework Programme. Prof.Dr. Mathias Rohe is Chair for Civil Law, Private International Law and Comparative Law at the University Erlangen-NÃ¼rnberg, Germany. He is also Director of the Erlangen Centre for Islam and law in Europe, a judge at the court of appeals NÃ¼rnberg (retired), member of the German Islam Conferences (Ministry of the Interior) and the Austrian Islam Dialogue Forum (State secretary). He is the author of numerous publications and lectures on Islamic law in the past and present, Private International law, Comparative law and legal issues related to Muslims in Europe.